Throughout the past 4-5 weeks, I've been trying to blitz through the anime I missed out on last season while attempting to keep up with the current one. It's no easy task juggling the two seasons but it's a problem that I welcome with open arms. 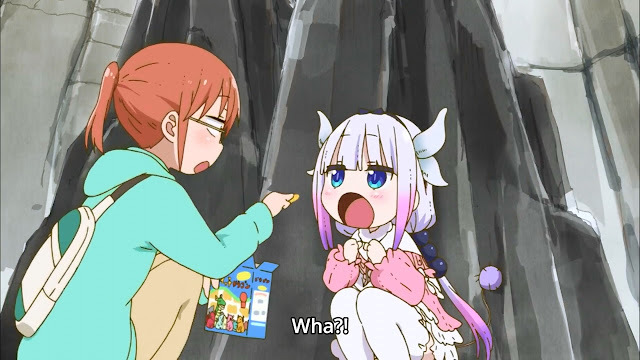 The previous Winter season was filled with slice-of-life anime and Kyoto Animation's Miss Kobayashi's Dragon Maid stood out among the rest, mainly because of its wacky premise. 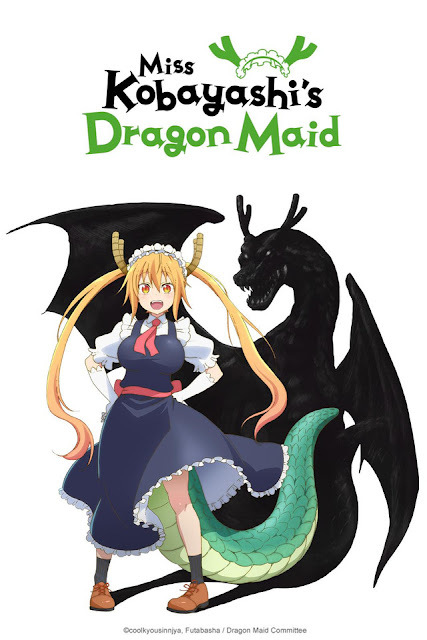 I kid you not, it really is about a programmer named Kobayashi and a dragon who decided to become her maid. The source material was created by Coolkyoushinja, the same mangaka who produced Danna ga Nani wo Itteiru ga Wakaranai Ken (I Can't Understand What My Husband Is Saying) so I was confident that the story, despite its less than conventional premise, was nothing to scoff at. Kyoto Animation didn't adopt their usual style when adapting the character designs from the manga, deciding to retain Coolkyoushinja's one instead. Little wonder why I thought the characters looked so familiar from the first episode. 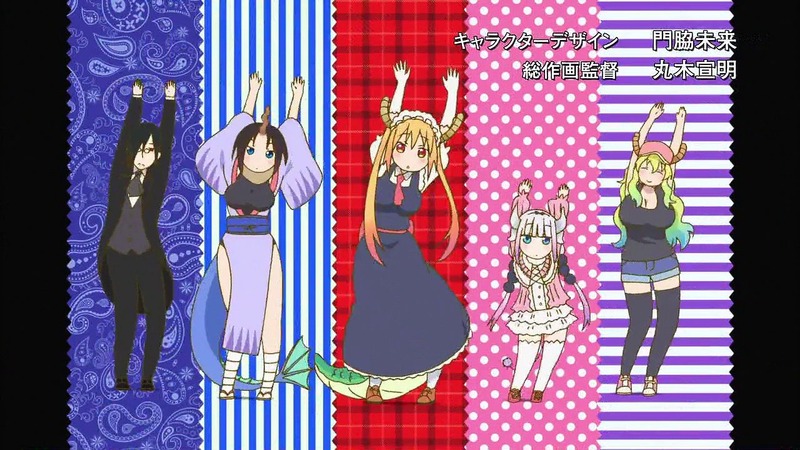 Speaking of character designs, I loved the human forms that the dragons adopted for the bulk of the season along with the various outfits they were in, be it Elma's ill-fitting formal wear or Lucoa's revealing casual clothing. They screamed 'moe' and could even give Doga Kobo's Gabriel DropOut a run for its money. I've lost count of how many screenshots and gifs I saved while watching this anime and Kyoto Animation even improved on Coolkyoushinja's character designs from the manga while still utilising his unique style. Miss Kobayashi's Dragon Maid's plot is easy to follow, bar the odd circumstances in Kobayashi's household of course. Her deadpan demeanour and dry wit provide a great contrast to Tohru's energetic and cheerful personality as they adjust to living together through the course of the season. 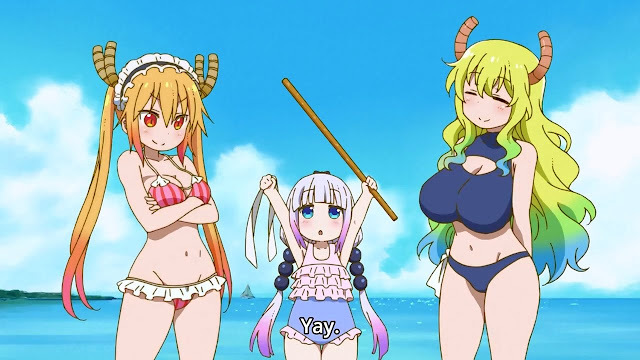 More dragons are introduced, via Tohru's phone calls for Lucoa and Fafnir and eventually all of them attempt to lead a normal life in Japan after dropping by to visit Tohru. The anime is deceptively entertaining and even watching Tohru tackle a simple task like cleaning the laundry elicits more than a few chuckles from me. It so happens that her saliva has cleansing properties, much to the chagrin of Kobayashi. 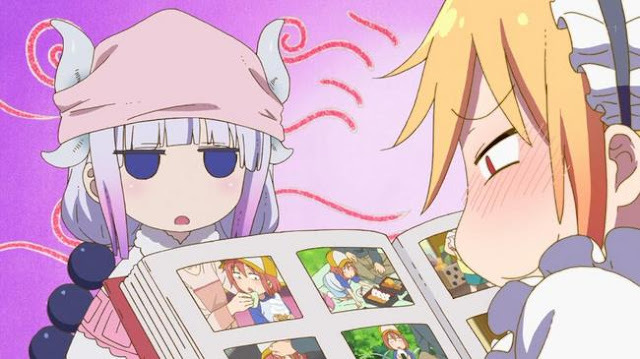 As efficient as it might have been, Kobayashi was hardly in favour of Tohru sucking on dirty laundry. Like Gabriel DropOut, Miss Kobayashi's Dragon Maid had catchy opening and ending theme songs. I watched each episode from start to finish, ignoring my usual practice of skipping the opening theme and ending theme after hearing each one once. The cute animation sequences for each theme song certainly helped to keep my cursor a good distance away from the pause button. 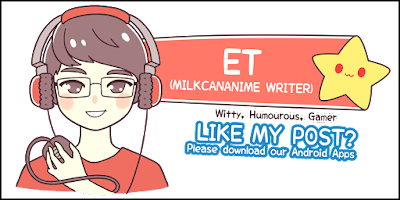 The slice-of-life genre has always polarised fans but Miss Kobayashi's Dragon Maid is a great introductory title to those who might be used to more action-packed and fast paced anime, easing them in to the genre. The unexpected fight scenes featuring spectacular choreography ala One Punch Man had me on the edge of my seat. These cute and bubbly girls are dragons after all. I'll miss this quirky anime and fingers crossed that a second season will eventually be produced. No Comment to " Miss Kobayashi's Dragon Maid "